They say that the more often you do something, the better you get at it. But, contrary to popular belief, this isn't always a good thing. Sometimes I give the kids in my daughter's fourth grade class their individualized spelling tests, and on a few occasions, I've seen the way this principle can backfire. Every once in a while, a child will copy one of their spelling words incorrectly, and for a week they will study, and do all their spelling activities, with wrong word. 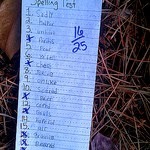 And guess what happens when I give them the spelling test? Yup - they miss the word. And, even though they spelled their word exactly as it appears on their spelling list, I need to mark it wrong, and give it back to them for the next week. And often they miss the word again the next week - because it's hard to unlearn what you already know, no matter how wrong it is. And sometimes, that can be an issue with following Christ. We are so used to living worldly, that changing - that doing the right thing - is a real, honest to goodness effort. We've spent the first part of our lives doing it wrong - whether "it" is parenting, praying, speaking, helping, how we treat others, or how we spend our money or time - and changing that isn't as easy as deciding to. Sin, my friends, is a hard habit to break. Just ask me. Or the Apostle Paul. Almost the entirety of the seventh chapter of his book to the Romans deals with breaking the sin habit, if you will. And the devil's desire for us to keep it. It's a struggle for all of us. We have these battles going on within us between what is wrong - though possibly familiar, comfortable, and/or easy - and what is right. We WANT to do what is right, but we don't. We desire to please God, but we keep doing what we always have been. It would be easy to feel hopeless about changing those bad habits - if it weren't for Paul's next sentence. We CAN'T do it on our own. But with Christ, we can break any bad habit. For we can do all things through Him (Philippians 4:13) - and He is greater than anything in the world (1 John 4:4). Lord, you know my heart AND my actions - and how often they don't align. Help me, Father, to "unlearn" the habits that are sin, and to do what is right in Your sight - both out of habit and out of love for you. In Jesus' name I pray. Amen. What Habits Do You Need To Unlearn? Are You Seeking Help From the Father? Thanks for such an interesting post! So much so that I've blogged about it here - http://www.paulassharingspot.com/2013/11/no-longer-bound.html. Wow - very cool. Thanks, Paula!